Cam's Cinematic Episodes: Film Review - THE INTERNATIONAL: A Political Thriller That's Fairly On The Money! 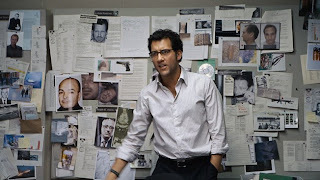 Film Review - THE INTERNATIONAL: A Political Thriller That's Fairly On The Money! Nobody in North America is particularly enamoured with the banks at the moment, so what better time to release a high-concept political-minded thriller featuring a dogged quest to end the sinister machinations of a terrorist-funding financial institution? 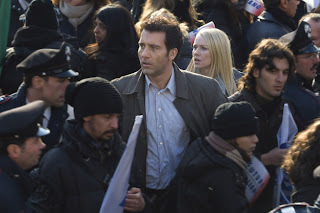 Especially one which features the roguish, dark charms of brooding Brit Clive Owen, and the concentrated, sprite-ly pluck of Naomi Watts, packing heat, taking names and pounding the pavement? Why, if I were a studio executive I’d say The International was guaranteed to be money in the... Umm, well, you get the drift. Playing Louis Salinger, a strong-willed, bedraggled Interpol agent, Owen is at his Children of Men-int ense finest, battling tirelessly to expose and topple the Luxembourg-based International Bank of Business and Credit. It seems the IBBC counts, among a plethora of assorted illegal interests, selling armaments to Third-world countries in order to create astronomical debt as a viable and lucrative business opportunity. However, after the bank stealthily murders Salinger’s American colleague in Berlin, he finds himself perilously close to being in over his head. In teaming with dedicated Manhattan Assistant District Attorney Eleanor Whitman (an underused and underwritten Watts), Salinger finds a partner as strong-willed and resolute as himself. As the two investigators be gin the pain-staking process of tracking and uncovering the morally shady participants (led by the intensely slimy Ulrich Thomsen) behind IBBC’s bold, deadly power-play, they quickly find the degree of threat towards their personal safety escalating. Nevertheless, in slowly discovering the implications of the conspiracy’s true intentions, which also involves political assassination, Salinger and Whitman must choose whether to stay on the straight-and-narrow or to attempt to beat the bank at its own dishonest game. While The International aims for lofty levels of political relevance and insight, it’s actually far more superior, and accessible, as a down-and-dirty espionage vehicle. Direc tor Tom Tykwer, who earned our undivided attention with 1998’s pulsating attention-grabber Run Lola Run, has crafted a sharply engaging paranoia-drenched slice of labyrinthine fun. 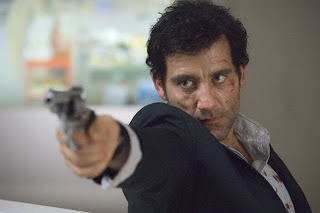 With tension-dripping dramatic scenes, such as the aforementioned assassination attempt, as well as an extended section of the film, which owes a great dept to The French Connection, following Owen and two NYPD colleagues as they trail an IBBC-funded hired gun, Tykwer holds our attention (and breath) with the skill of a sharpened professional. He also shoots the architecture of the film’s steel-edged buildings and European cobble-stones with a travelogue-maker’s passion and flair. Adding considerably to the suspense and intrigue is the grounding presence of the hard-edged Owen, really engaged and on his game here, as well as an ace supporting cast of great-looking faces and personalities. Armin Mueller-Stahl, who last shone as a Russian mob godfather in David Cronenberg’s Eastern Promises, provides a weary, cynical charisma to the film, playing an emotionally-conflicted IBBC conspirator. 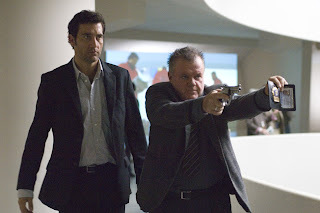 Also grittily efficient are the realistic performances of Jack McGee and Felix Solis, as the NYPD cops who aid in the show-stopping hitman-trailing set-piece, who look and feel like genuine tough-talking Big Apple flatfoots, as well as the peculiarly threatening Brian F. O’Byrne as their clean-cut, yet shadowy prey. Where The International invariably fumbles unfortunately, is in the resolution of its globe-spanning story. 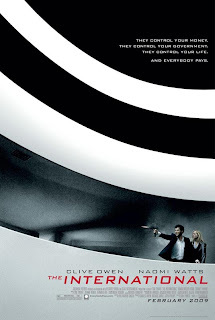 Following a nail-biting scene of undercover surveillance at the Guggenheim, the film inexplicably turns a bizarro corner into James Bond-ian territory, with half-a-dozen uzi-packing assailants turning the gorgeous interiors into a landscape of bullet-holes and shattered glass. The scene, while gripping, and expertly directed and edited, feels at complete odds with the events leading up to it. One almost has to wonder if it was simply added on to jostle viewers with short attention spans. Likewise, a final confrontation in Istanbul with IBBC head-baddie Thomsen feels underwhelming and needlessly complicated, providing no real sense of satisfaction or conclusion. To be sure though, the sheer abundance of slick film-making proficiency helps overcome these slightly disconcer ting problems, as well as the obvious preposterousness of the plot. Ultimately it’s a decent film aimed at those who enjoy a good political-based yarn full of straight-faced performances, edgy intrigue and clipped, complex dialogue full of detailed jargon and strong declarations. So, if you, like me, are growing tired of the profusion of juvenile junk currently crowding into theatres, you could do immeasurably worse than investing your time and money into The International. *Originally printed in SFU's The Peak: Feb. 23rd, 2009. Epi-Cast: Episode 6 - "An Oscar-batory Exodus."